What kid hasn't been asked that question? Adults impulsively ask children of their dreams from the moment they can talk. Maybe it’s because so many adults aren’t following their own dreams, or maybe what they wanted to be when they were 4-years-old was ludicrous in terms of financial stability. Last time I checked, fairies didn’t get a 401K plan. My heart would feel relieved because the reality is he’d be very good as an engineer. He can be socially awkward since it is a very solitary job. His obsessive compulsiveness of needing things in order and on schedule would actually be an asset. Then he moved into the Superhero phase, and when asked the age-old question I thought for certain his answer would be “Spiderman/Batman/Green Lantern.” But instead it was “scientist,” another job that would be perfect for someone on the Autism Spectrum. I was elated and embraced this dream by purchasing science kits, microscopes ... anything that would further his love of learning science. People on the Autism Spectrum are very literal, typically good at math and science and would work best in an environment where they don’t have to engage in team activities. 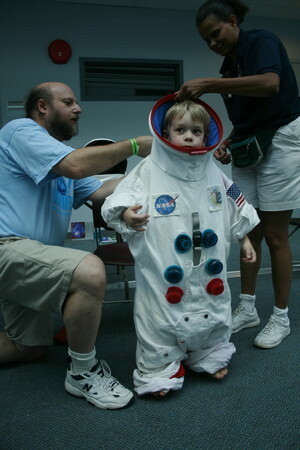 My son has moved from dreams of being a scientist to an astronaut. How do you tell your eight-year-old that NASA is no longer sending people to space? The light in his eyes while he looks at pictures online of the final launch, my heart hurts for him and for all the kids who dream of being an astronaut or an engineer that builds spaceships. His birthday is approaching; I walked the aisles of the Toys R Us searching for something space related. If my son was interested in war I would have a hard time deciding which gun to purchase amongst the entire aisle of guns, bombs and night-vision goggles. What does this say about the state of our country when you can find a plethora of war weapons for children, but you can’t find an astronaut or a spaceship to save your life?